RNAi regulatory functions in development and the onset of cancer. The relatively recent discovery that double-stranded RNA (dsRNA) and its functional derivatives (siRNA) could mediate potent and specific gene silencing in a wide variety of species sparked a revolution in molecular biology. While first discovered in C. elegans, now a recognized group of related phenomena broadly conserved in eukaryotes is generally known as RNA-mediated interference, or RNAi. Central actors to these phenomena are small ~18-25nt non-coding RNAs which are matured by the RNase type III Dicer, and assembled with the Argonaute proteins into a variety of effector silencing complexes. RNAi was first recognized for its potential as a research tool and for the therapeutic promises it holds. It is now widely used in all fields of biomedical research. Soon after its discovery it became clear that the RNAi-related phenomena serve a profound physiological purpose. In one such mechanism termed microRNA-mediated silencing, small RNAs are derived from gene-encoded hairpins and negatively regulate gene expression by base-pairing and silencing messenger RNA by post-transcriptional means. According to predictions, they exert a direct negative regulation pressure on more than 30% of the entire coding gene set. In agreement with such spectacular estimates, microRNA targets have been implicated in the broadest range of cellular functions in developmental, and steady-state contexts. Consistently, some of the small RNA expression events were recently shown to be functionally important for transformation and tumor growth. More recently, yet novel RNAi-related phenomena have emerged. While RNAi was originally thought to be a sequence-directed innate immunity response, these new forms of RNAi (named here loosely endoRNAi) appear to serve other fundamental functions such as mediating heterochromatin formation or consolidation. 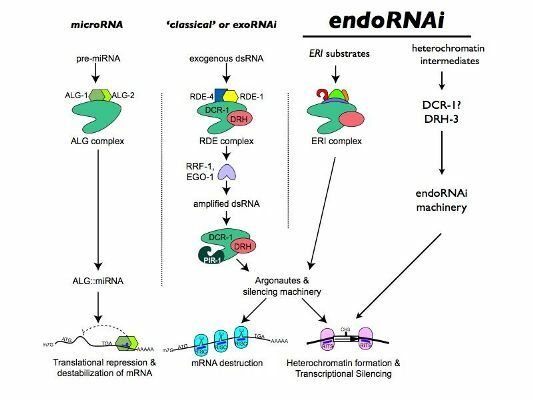 Loss of machinery involved in endoRNAi results in a broad genetic instability, loss of chromosomes during mitosis, as well as localized and global gene mis-expression. Data from a variety of model systems support a model whereas small RNAs are derived from chromatin loci, and converge back on genomic regions to mediate changes in levels of chromatin folding by directing histone modifications. While these new functions for RNAi are only emerging, it is clear that they will have deep implications on our understanding of how the genome is organized and protected. They also offer a whole new set of possibilities to explain how cellular processes can be altered during the emergence of cancer. My research program has two aims: 1- Understanding the molecular basis for the gene regulatory functions of endogenous RNAi, and 2- Defining small RNA expression events, which are critical for development, and cancer ontogeny. Duchaine, T., Wohlschlegel, J.A., Kennedy, S.G., Bei, Y., Conte, D, Jr., Pang, K.-M., Brownell, D.R., Harding S., Mitani, S., Ruvkun, G., Yates J.R., III, and Mello, C.C. Functional proteomics reveals the biochemical niche of C. elegans DCR-1 in multiple small-RNA mediated pathways. Cell, Jan 27, 2006.